Many cities in the global south witness heterogeneous pollution sources involving multiple stakeholders and thereby rendering it difficult to regulate. Regulations of air, water and solid waste management thus requires comprehensive Environmental Management Plan (EMP) that involves community participation. A good EMP should delineate the mitigation measures, monitoring and evaluation plans, citing specific roles and responsibilities of key personnel, the implicated cost and anticipated deadline; so as to minimize the adverse effects of the activity to the environment, health and safety. 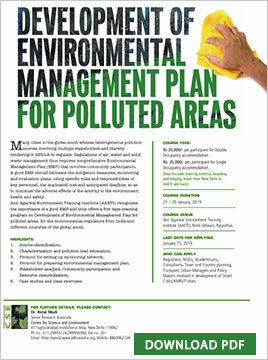 Anil Agarwal Environment Training Institute (AAETI) recognizes the importance of a good EMP and thus offers a five days training program on Development of Environmental Management Plan for polluted area; for the environmental regulators from India and different countries of the global south. Case studies and class exercises. COURSE VENUE- Anil Agarwal Environmental Training Institute (AAETI), Nimli, Rajasthan. WHO CAN APPLY- Regulators, NGOs, Academicians, Consultants, Town and Country planning, Transport, Urban Managers and Policy Makers involved in the development of Smart/AMRUT cities. For online registrations please click here.